« Say, Isn’t That the Colonnade? 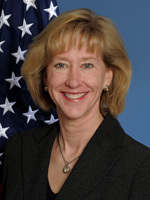 Throughout her 28 years as an officer-lawyer in the U.S. Army, Brigadier General (Ret.) Malinda Dunn, a 1981 graduate of the Washington and Lee School of Law, has broken ground in several areas. She was, for instance, the first female staff judge advocate of the 82nd Airborne Division, with which she did two tours; she was the first female chief of personnel for the Army JAG Corps, the first female staff judge advocate of the XVIII Airborne Corps, and the first woman selected as a general officer in the active-duty Army Judge Advocate General’s Corps. Earlier this month, Malinda accepted a new challenge: the executive directorship of the American Inns of Court, which comprises judges, practicing attorneys, law professors and students who meet regularly to discuss and debate issues of legal ethics and professionalism.